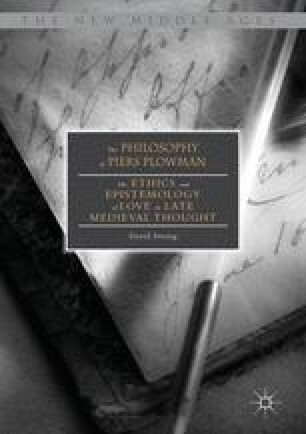 The introduction presents a succinct discussion of those Scholastic fields of thought illuminating the dominant themes underpinning Piers Plowman, namely natural rights, epistemology, and freedom of the will. Within this discussion, it points out the intellectual continuity between the poet, William Langland, and the contemporary philosophers, John Duns Scotus and William of Ockham. The interchanges between the text’s main character, Will, and the allegorical personifications of learning underscore his ability to identify what is right, grasp its surety, and ultimately privilege an affective over an intellectual response. This “kynde knowyng” orders natural love, elicits charitable actions, and refines rational free choice. Realizing that love is the apex of the human condition proves that a sublunary thinker must properly align his intellectual focus to embrace a higher truth.